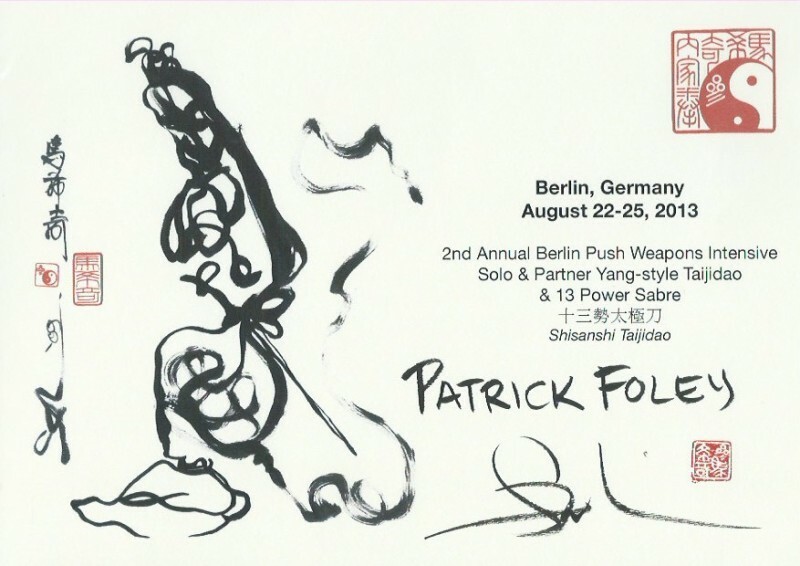 Patrick Foleywas brought up in Singapore and Malaysia and still has very strong ties to the culture of the Far East. 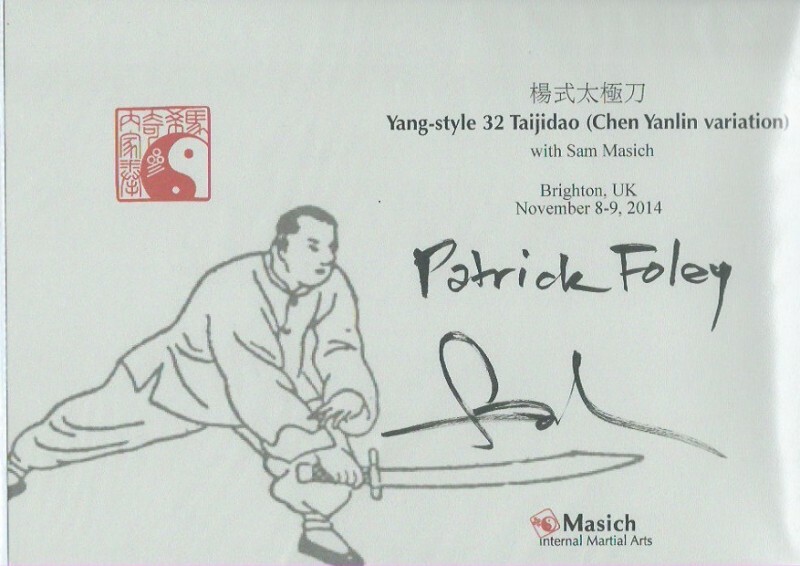 He was first inspired by the martial arts when he was introduced to a Kung Fu master in Malaysia at age 15. 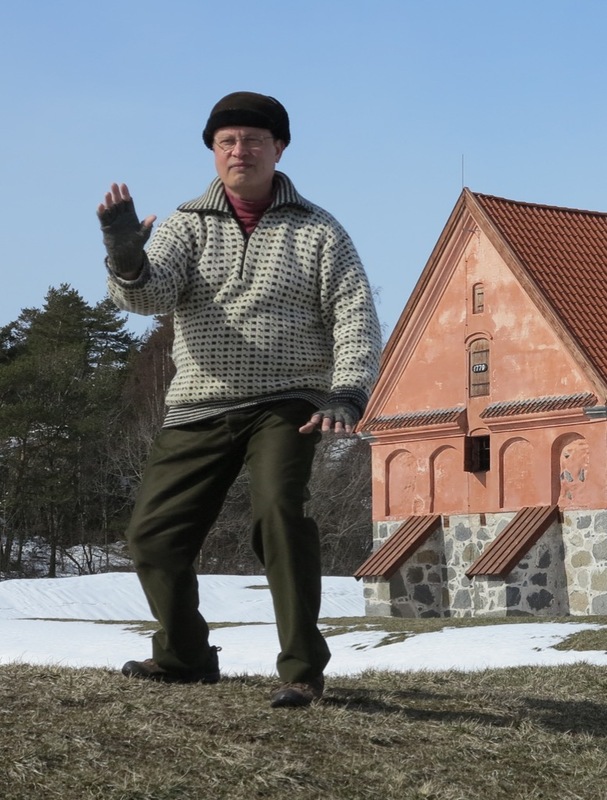 He began his exploration of Tai Chi in the late 1980's, after 5 years of judo, jujitsu and karate training with 8th Dan judo sensei Joe Robinson. 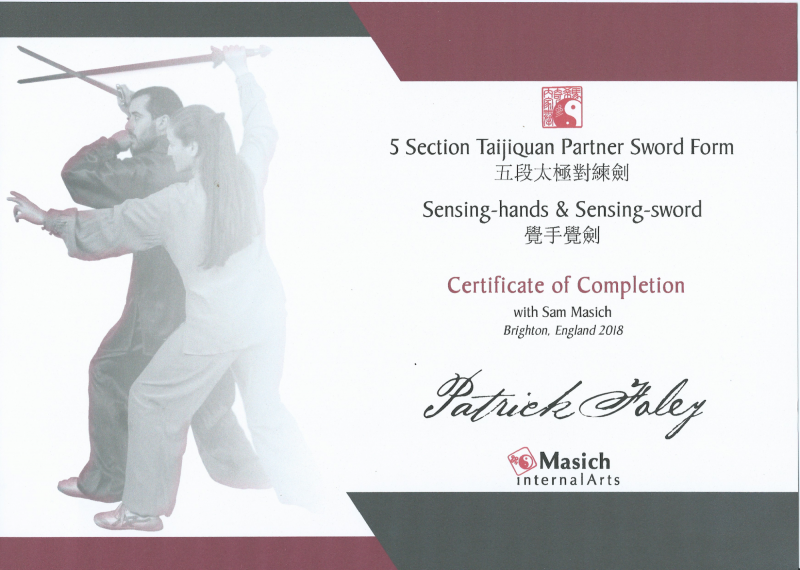 Unfortunately competition training had left him with two very damaged knees, and he was told to drop all contact sports. 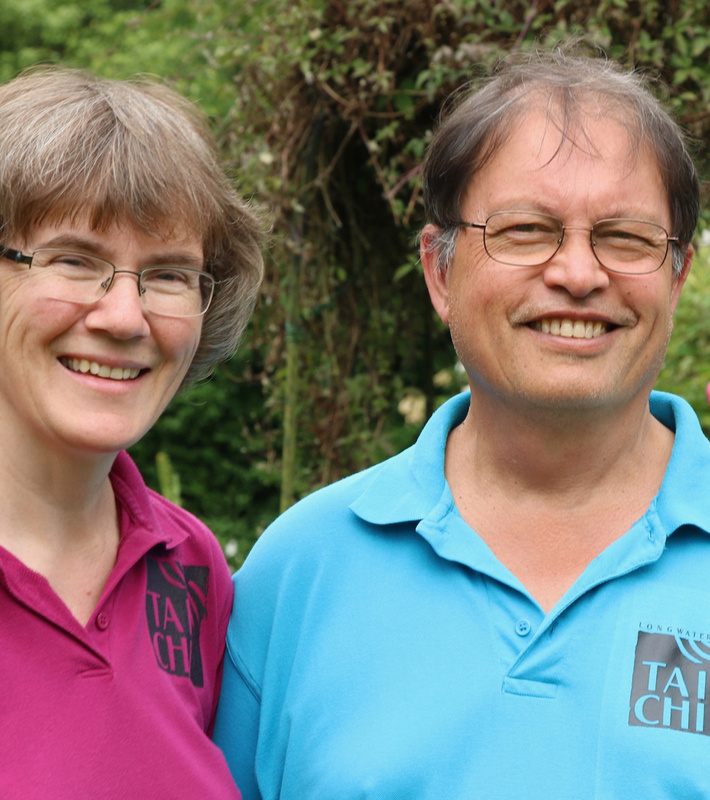 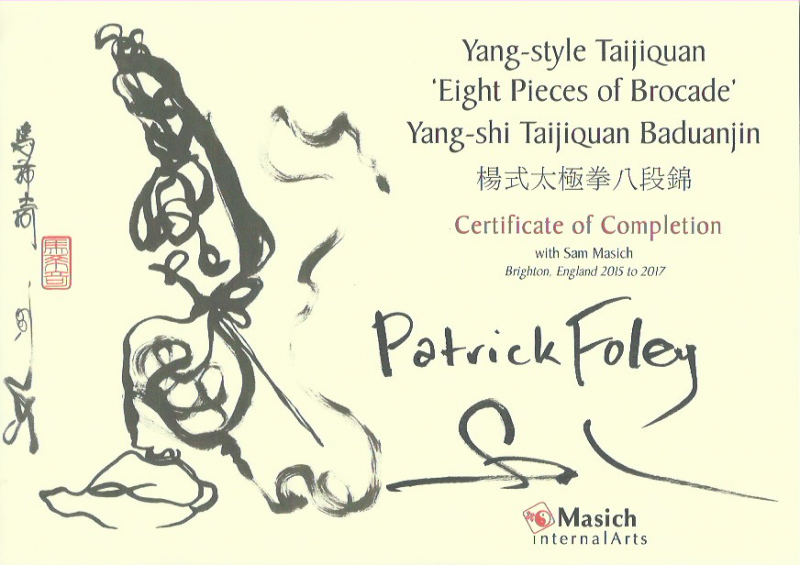 In 1991 Patrick joined Tai Chi teacher Brian Cooper's Brighton class (Inside Tai Chi) and has been practising under his guidance ever since. 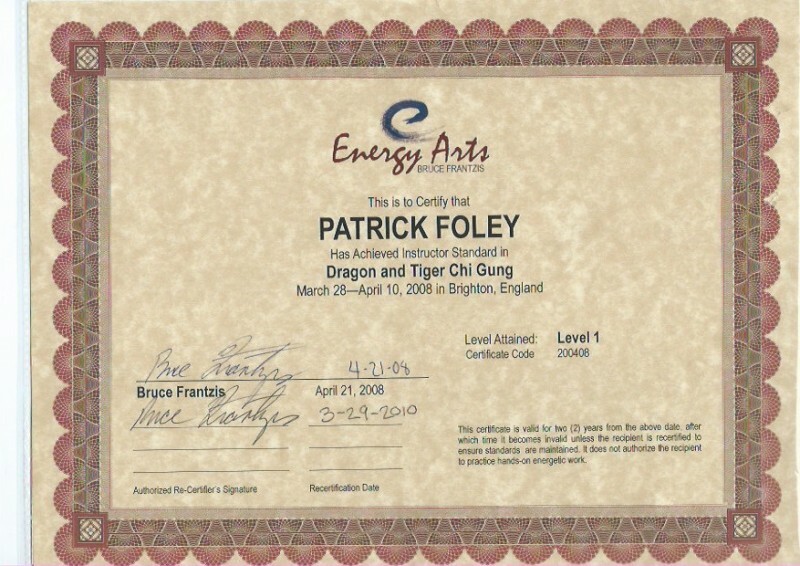 Originally learning Rose Lee's version of the old Wu long form with Brian, Patrick was then introduced to lineage-holder Bruce Frantzis (Energy Arts), on whose methods Brian had decided to focus his teachings. 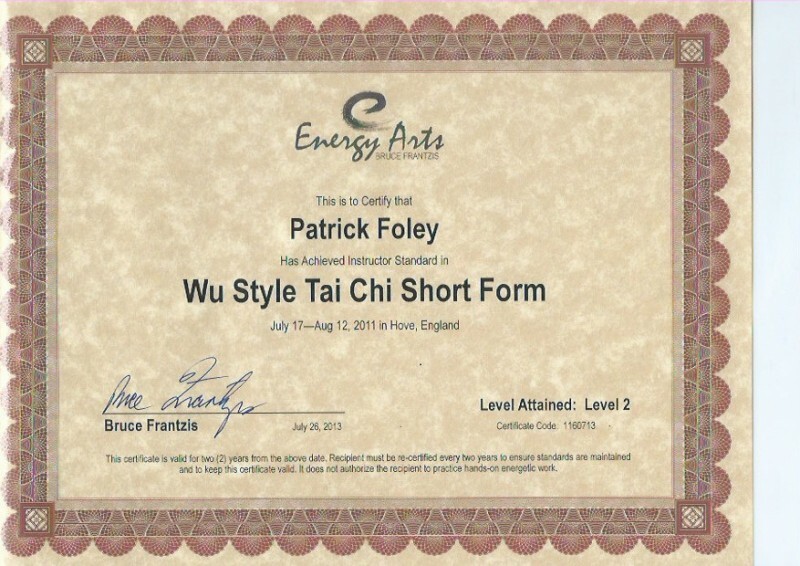 He has studied the Wu-style short and long forms, Taoist Neigong, Push Hands Bagua and Meditation with Bruce and Brian. 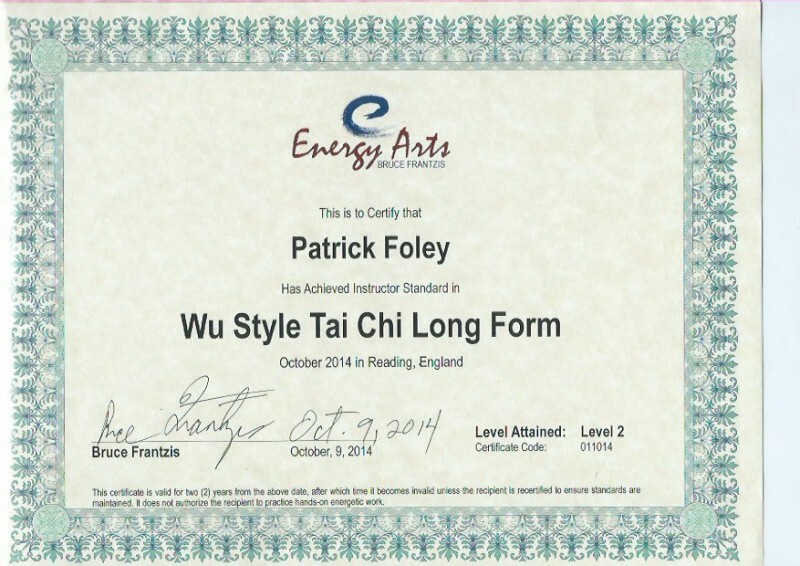 He has also studied various other Tai Chi and Chi Gung styles, including Fan Form, with teachers in Malaysia. 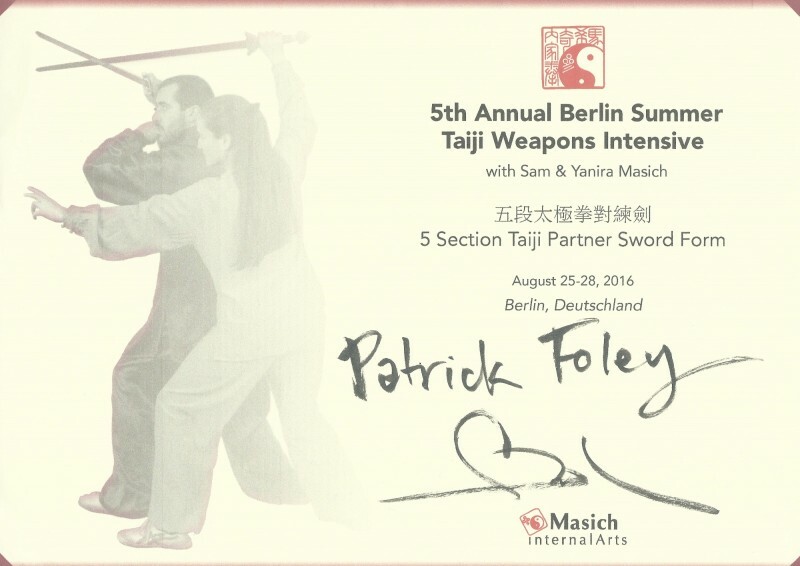 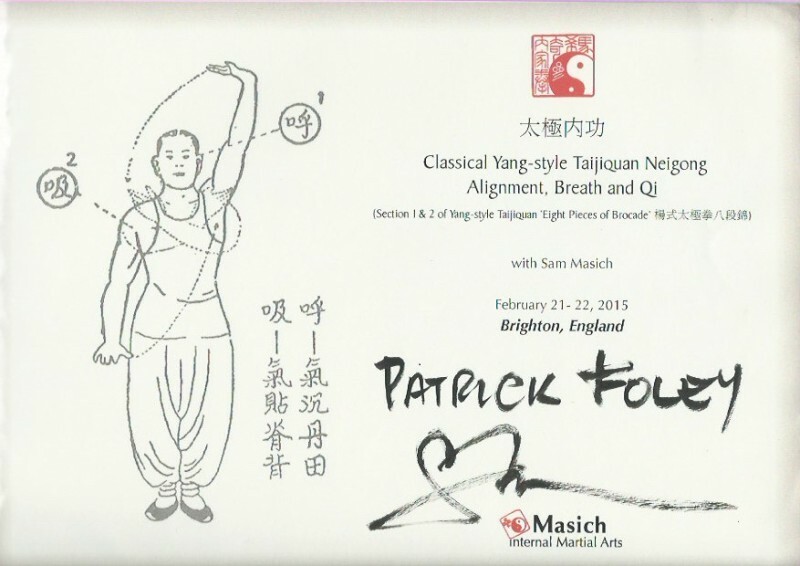 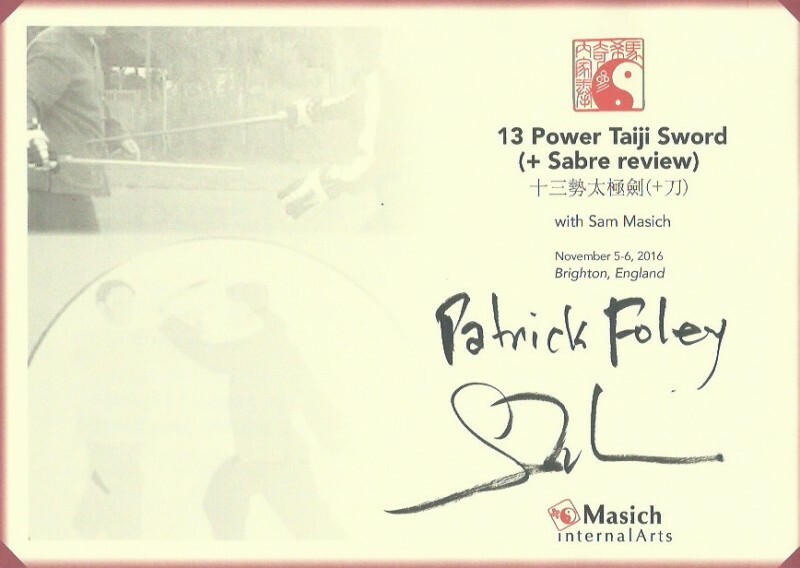 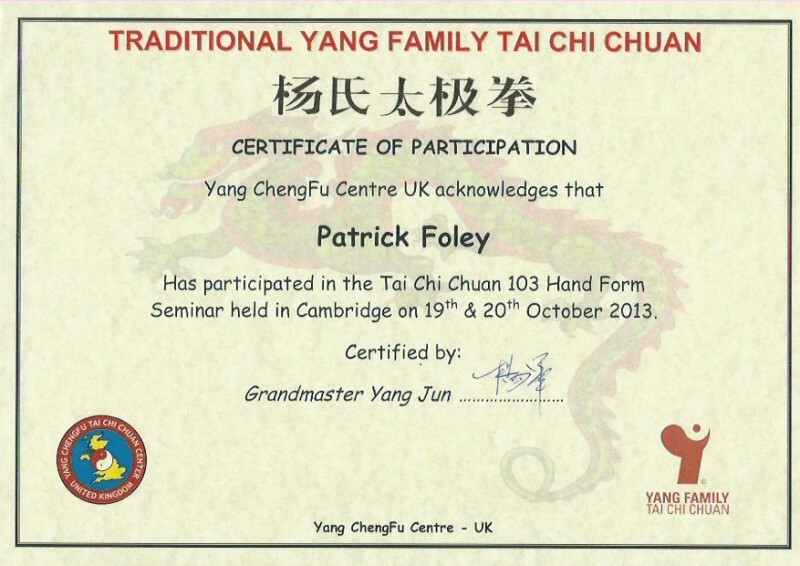 Since around 2012 Patrick also began studying with Master Sam Masich, to better develop his understanding of traditional Taijiquan subjects, including the full 5 Section Taijiquan curriculum, Yang 108, Yang sword and sabre and push hands (tui shou). 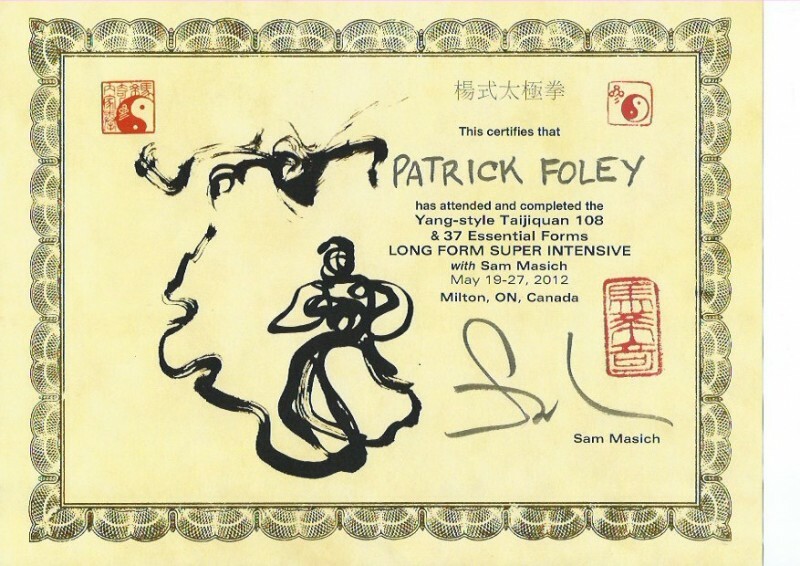 Studying with Sam has been a deeply satisfying and liberating experience and Patrick hopes to focus his future studies in this direction with this world-renown teacher. 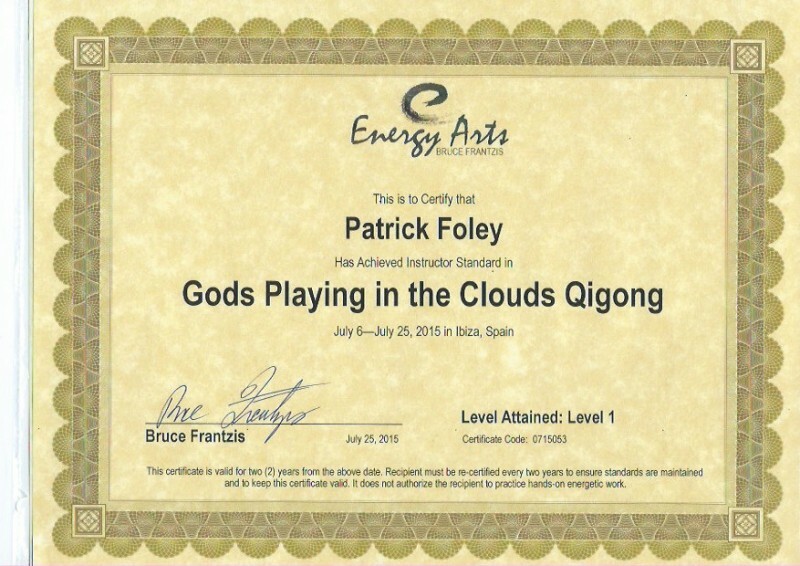 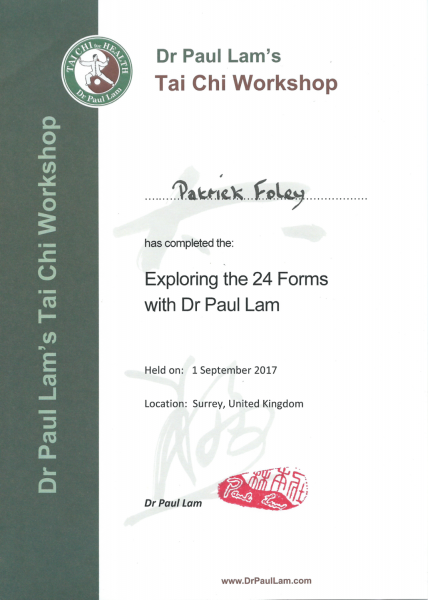 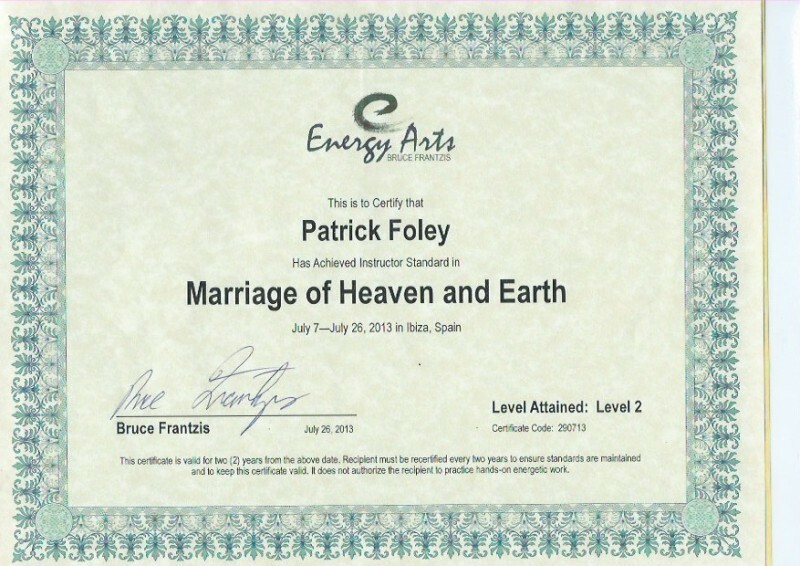 Patrick began teaching in 2004 and is an senior instructor of the Tai Chi Union for Great Britain, and certified Level 2 Energy Arts instructor, Five Section Taijiquan instructor (Full Curriculum), Tai Chi Qigong Shibashi Set 1 Certified and Tai Chi for Health and Energy instructor (lapsed). 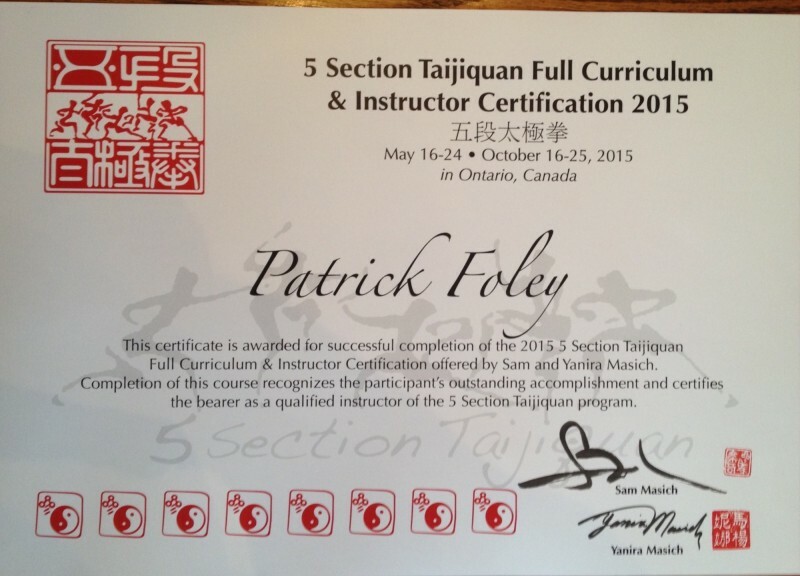 Studying one-to-one with an experienced teacher has many benefits. 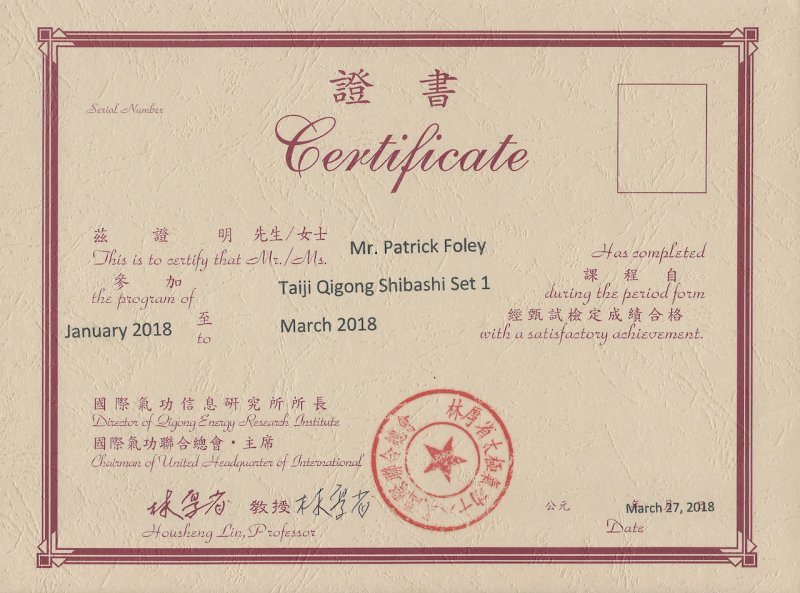 Within your normal taijiquan practice, it is quite common to develop misconceptions about what you know and what you are experiencing (externally and internally). 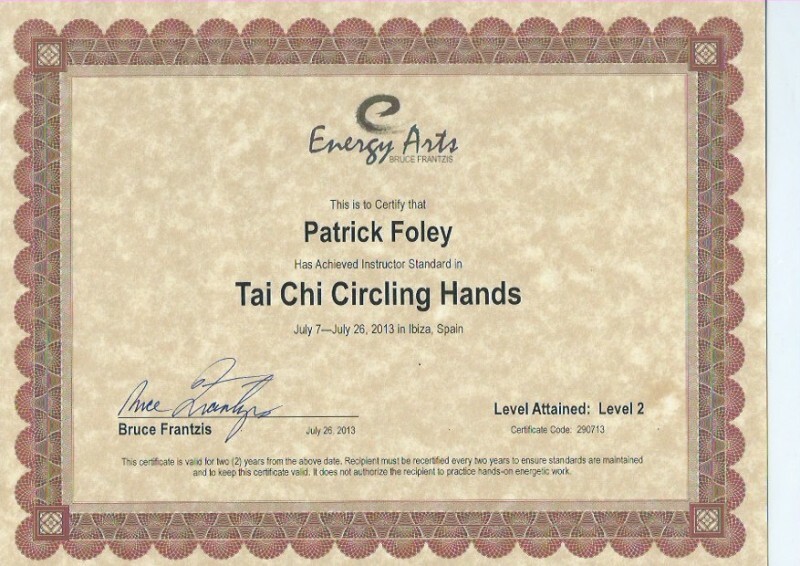 Even in a class environment with other students, it is quite normal for there to be several interpretations of what the teacher said or demonstrated, which are then taken into each students solo practice. 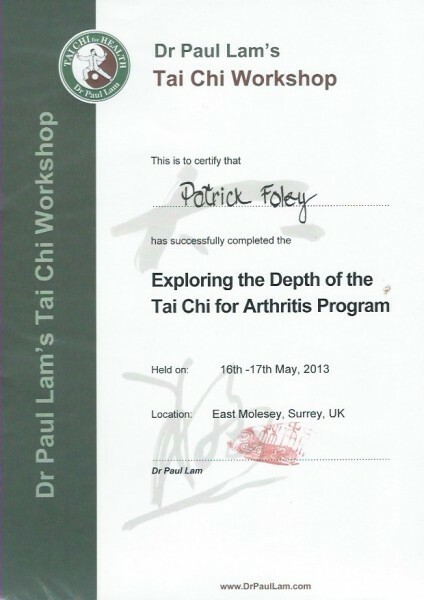 It is also sometimes difficult to ask the question you really want to ask. 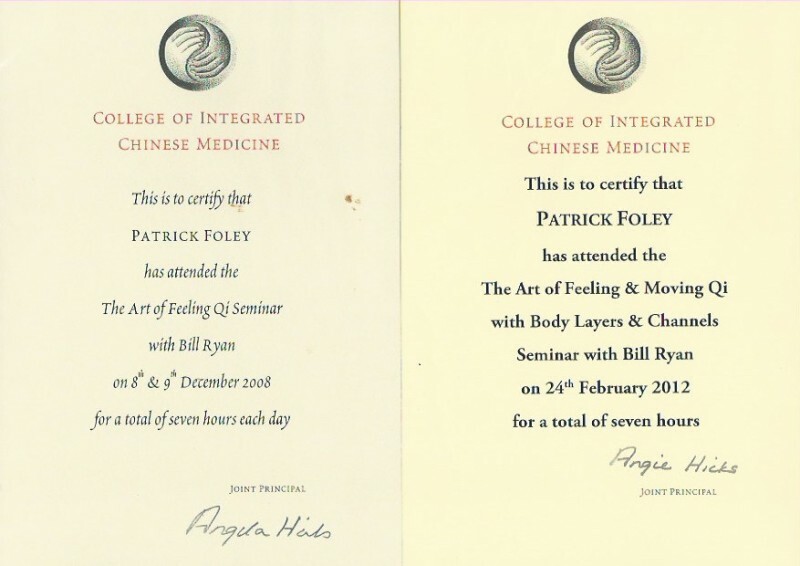 Patrick has many many years of study and teaching behind him, and has probably made all the mistakes a student could make, and learnt from them (mostly!). 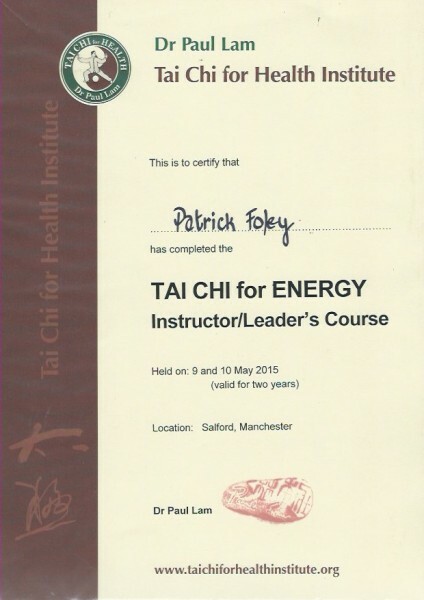 Studying directly with him can offer you a fast track method of progressing in your practices. 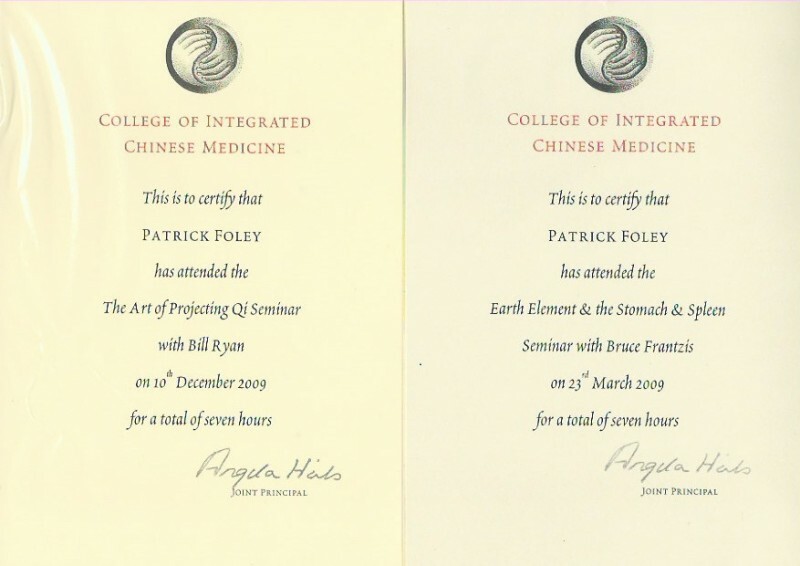 One hour of a teacher’s direct attention is also worth many hours of attendance in a regular class. 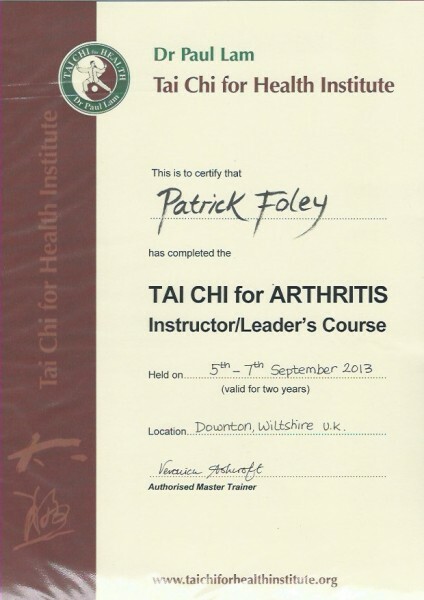 Charges are based on one hour of teaching time but you should allow 1hr 15min in your schedule when booking, as there are always ‘settle in’ and ‘debrief’ sessions before and after the lesson. 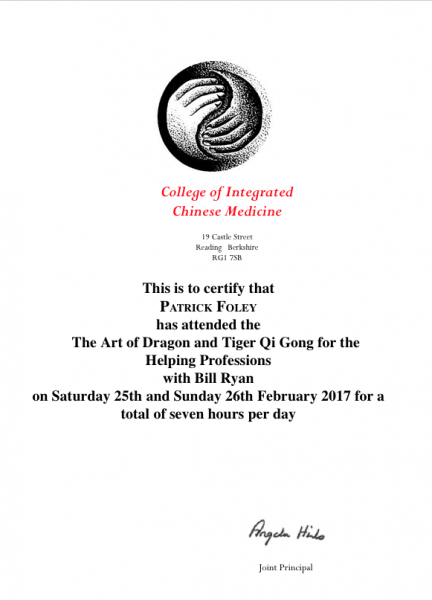 £90 per hour for 2 students of similar experience. 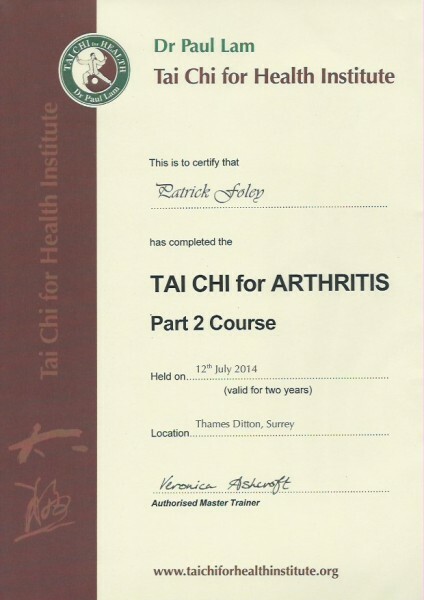 £120 per hour for 3 students of similar experience. 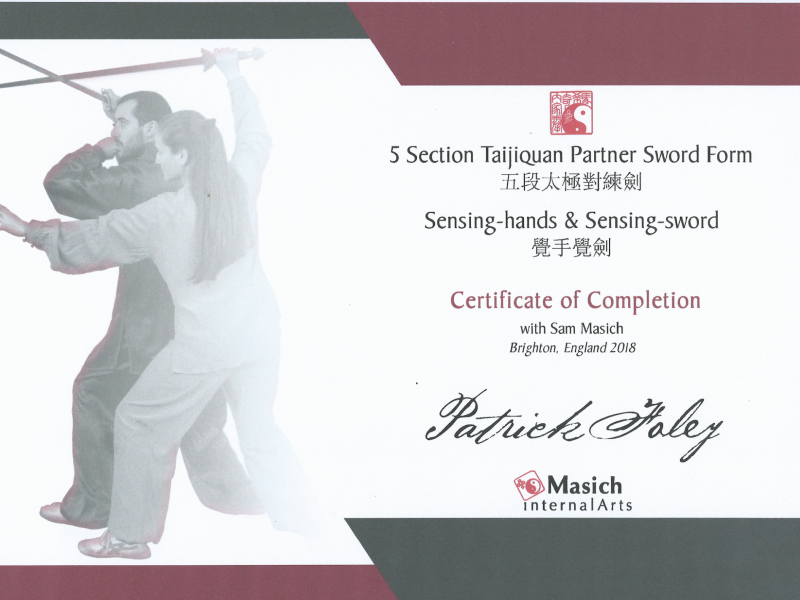 Discounts for booking 3 or 5 lessons in advance.